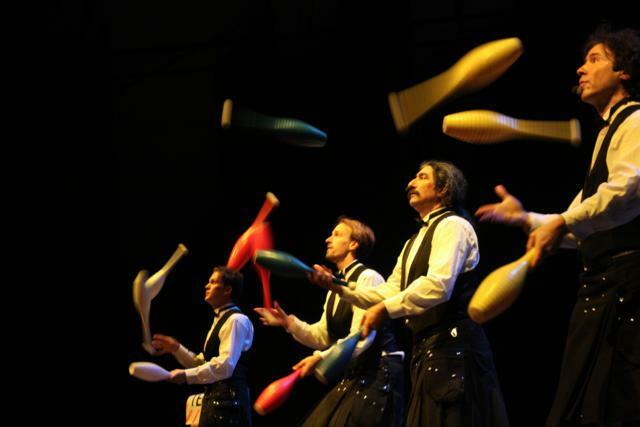 They can't fly, they're not Russian and they're not brothers: American juggler troupe The Flying Karamazov Brothers have gone from off-Broadway to an-entire-ocean-off-Broadway to land up, most appropriately, at the Vaudeville Theatre. This is vaudeville's own male Spice Girls, four chaps with their own made-up monikers (Pavel, Dmitri, Ivan and Aleksey), musical talents and a taste for women's clothing (well, kilts). While none of them goes as far as that Union Jack dress, there are obvious attempts here and there to ingratiate themselves to the locals with above-par references to the Lords, the Coalition and their education policies: "I didn't go to university for nothing, I paid for it...and, pretty soon, so will you." It would be too easy to paint them as one-trick ponies. Yes, much of the action does involve throwing stuff around to each other and if you always fast-forwarded over the circus acts on Britain's Got Talent, there's a decent chance that this show is not for you. Having said that, amidst the set pieces, there's a goodly amount of music and japing around. Audience participation is both general and specific. Before the show starts, audience members are encouraged to leave on the stage items for one of the Brothers to juggle later. There must have been some particularly evil minds in tonight as the items included a half-opened beaker of whipping cream and a small pot of jelly ("jello"). By the time the juggler was done, the stage looked no different to the end of a three-year old's birthday party. Unless you have a grand desire to be threatened with a cream pie in the face or to discover what it's like to have flaming torches whizzing inches past you, we strongly suggest not sitting at the front. The Flying Karamazov Brothers are a perfectly satisfying experience. When the bulk of London's cabaret performers go north for the summer, they will be one of London's circus highlights. Until then, there is better and cheaper competition most nights around the capital, for example at the Royal Vauxhall Tavern, Madame Jojo's, the Bethnal Green Working Men's Club, CellarDoor, London Zoo or one of the plethora of dinner-cabaret joints. The Flying Karamazov Brothers will be at the Vaudeville Theatre until 10 September 2011. Tickets are around £29.50-£39.50 but special rates apply for school groups and groups of ten or more. More information here. Tickets for this event were provided by a PR firm. Check out our weekly Cabaret Zingers for our recommendations. Ace juggler Mat Ricardo has some explosive views on Britain's Got Talent.